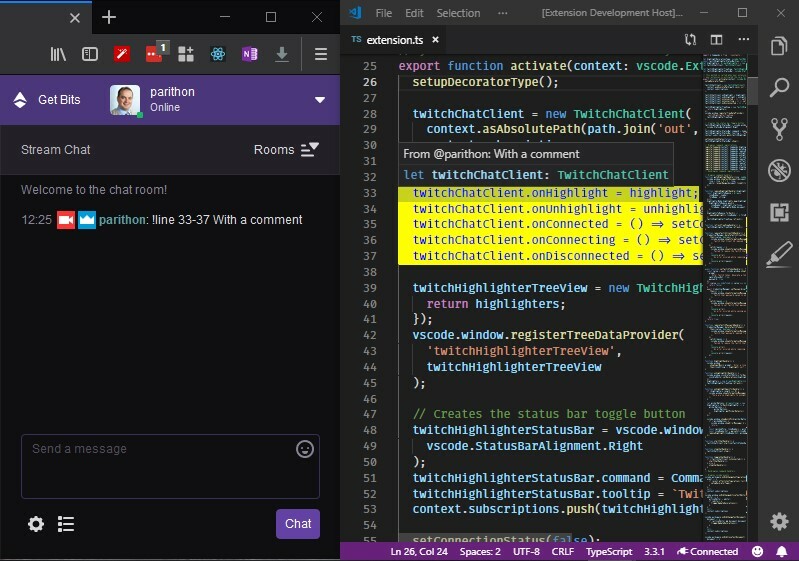 Visual Studio Code>Other>Twitch HighlighterNew to Visual Studio Code? Get it now. Allow your Twitch viewers to help in spotting bugs, typos, etc. by sending a command in chat that will highlight the line of code they want you to check. A VS Code extension to allow your Twitch viewers to help in spotting bugs, typos, etc. by sending a command in chat that will highlight the line of code they want you to check. Save this token temporarily in a safe place as you will need it later in the Getting Started section. Save your changes and close that tab. Go back to the Settings UI tab. Find the Nickname setting. If you are using your own account for the chat bot then enter your account username as the value here. If you created a separate account use that username. Save your changes. In the status bar, click the "Disconnected" button. After clicking it, you'll see a notification that the extension is missing Twitch Credentials. Click the Disconnected button and you should see notifications indicating the extension is starting and finally started listening to the Twitch chat. twitchHighlighter.nickname: The username the bot should use when joining a Twitch channel. Note: this is required if you'd like to have the bot send join/leave messages in your chat. It also needs to match the Twitch username with which you generated the OAuth token. twitchHighlighter.highlightColor: Background color of the decoration (default: green). Use rgba() and define transparent background colors to play well with other decorations. twitchHighlighter.highlightFontColor: Font color of the decoration (default: white). Use rgba() and define transparent background colors to play well with other decorations. twitchHighlighter.highlightBorder: CSS styling property that will be applied to text enclosed by a decoration. twitchHighlighter.announceBot: Whether or not the bot should announce its joining or leaving the chat room. twitchHighlighter.showHighlightsInActivityBar: Show the Highlights icon in the activity bar to display the tree view. twitchHighlighter.usageTip: A tip shared by the bot when a user chats: '!line'. Extension doesn't allow specifying the file to put the highlight in. This is a work in progress.